The focus of the Potato Program is to provide quality seed potatoes to commercial growers that is varietally pure and relatively free from disease causing organisms. Seed provided by the PMC is used as the initial stock for a multiple year certified seed production scheme. Why Use Certified Seed Potatoes? Alaska's potato crop is free from many serious pests and diseases that are common in the continental United States. Imported potatoes could introduce problems such as late blight, root knot nematode, viruses and other destructive organisms. Certification is designed to identify and remove from use those seed lots which have become diseased or are otherwise of reduced value for use as seed. Alaska's Certified Seed Potato growers start with disease tested stock and increase this seed in accordance with the strict certification standards. Growers manage their seed production to limit the possible exposure to diseases, but re-infection can occur from soil or other sources. The procedures used by the seed growers enable them to supply end-users with excellent quality planting stock of named varieties. 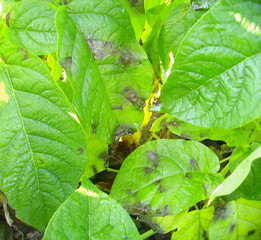 Only those plantings meeting the minimum disease tolerance are allowed. Seed potatoes are regulated because the potato is vegetatively propagated and many afflictions can be carried in or on the potatoes used for planting. Excluding diseases from seed stock is critical. Diseases can travel long distances by the wind or insects or transferred onto contaminated equipment. Planting Certified Seed will help you produce a good crop and will help protect your neighbors too. Generation zero (G0), virus-tested seed potatoes are produced at the PMC and are available for purchase in quantities of 2 lbs or more. The PMC produces G0 seed potatoes on a contract order basis 18 months prior to the delivery of the material. A list of available varieties is published near the end of each year and orders are accepted through January 31st. Those orders go through the tissue culture process January - May and then are planted in the greenhouse for G0 production. Those tubers are harvested in the fall for pick-up the following spring (April/May). So, for example, if an order is placed in December 2017, that seed will be ready for pick-up before planting in spring 2019. All surplus G0 seed production will be made available each spring on a first come, first serve basis. Once all pre-orders are processed, the PMC will publish surplus G0 availability. To inquire about purchasing certified seed potatoes, please email Christine Macknicki.